Monika Weiss is a Polish-American artist whose practice explores relationships between history and memory, time and space. Her process involves extensive research and collaboration with architects, historians, archivists and other specialists. In the words of British art critic Guy Brett, "Weiss creates an alternative experience of space and time, which is not end-driven but steady and enduring, establishing and deepening a human presence. Her work is a remarkable, individual counterpoint between technological media (video projection) and the ancient activity of drawing. Sound is also an important element, meticulously composed, which lifts the silent filmed actions into another emotional register." Born in Warsaw in 1964, Monika Weiss lives and works in New York City. Her works have been exhibited both in the U.S. and internationally. 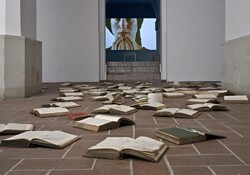 Weiss' most recent solo exhibitions include Monika Weiss: Sustenazo at the Centre for Contemporary Art Ujazdowski Castle, Warsaw (2010). In 2005, Lehman College Art Gallery, CUNY organized and published a comprehensive survey of the artist's work to date. Five Rivers was favorably reviewed in The New York Times. Other recent exhibitions include also Opening at Museum Montanelli, Prague (2010), Prisoner's Dilemma at Cisneros Fontanals Art Foundation, Miami (2009), Women and Olympic Games at Frauenmuseum, Bonn (2009), On the Absence of Camps at Kunsthaus Dresden (2006) and Moment by Moment at North Dakota Museum of Art, Grand Forks (2006). Publications about the artist's work include Drawing Now: Between the Lines of Contemporary Art, I.B. Tauris, London (2007). Weiss' own writing has been published in such books and journals as New Realities: Being Syncretic, Springer Wien/New York (2009), and Technoetic Arts: A Journal of Speculative Research, Intellect Ltd, London (2006). In 2009 the artist was awarded the New York Foundation for the Arts Fellowship in interdisciplinary category. Monika Weiss's work is represented by Galerie Samuel Lallouz, Montreal and Remy Toledo Projects, New York and is featured in public collections such as Albertina Museum (Vienna) and Cisneros Fontanals Art Foundation (Miami).